The MRH-90 Taipan multi-role helicopter is manufactured by Australian Aerospace. Image courtesy of Royal Australian Navy. The MRH-90 helicopter is operated by the Australian Navy and Army. Image courtesy of LSIS Helen Frank. The MRH-90 helicopter features a four-bladed main rotor. Image courtesy of LSIS Helen Frank. The MRH-90 helicopter offers a range of 800km. Image courtesy of ABIS Chantell Bianchi. The MRH-90 Taipan is an advanced medium-lift, twin-engine, multi-role helicopter manufactured by Australian Aerospace, a unit of Eurocopter (now Airbus Helicopters). The helicopter is operated by the Australian Navy and Army. The multi-role aircraft can be deployed to execute missions including troop transport, counter-terrorism, search-and-rescue, medical evacuation and special operations. It incorporates built-in safety features and offers enhanced manoeuvrability. 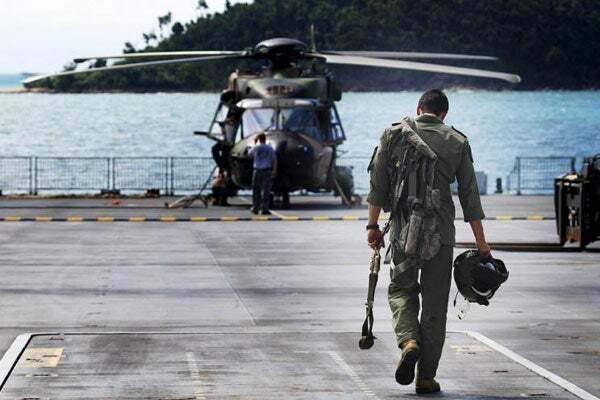 The MRH90 Taipan helicopters are set to replace the Australian Navy’s Sea King helicopters to perform enhanced maritime support and troop lift operations from land bases and Canberra Class amphibious assault ships. The Australian Army will use MRH90 to replace its S-70A-9 Black Hawk aircraft for improved combat capabilities. The Australian Defence Force (ADF) ordered a total of 47 MRH90s and the first 46 helicopters are scheduled to achieve final operational capability by April 2019. The versatile MRH-90 Taipan helicopter features all-composite construction and incorporates crash-worthy capabilities based on MIL-STD-1290A. The structure offers protection up to a speed of 10m/s when landing gear is extended and up to 7m/s with retracted landing gear. The Canberra Class Landing Helicopter Docks (LHDs) will be the largest vessels ever constructed for the Royal Australian Navy (RAN). The helicopter is 16.13m long and 5.23m high and has an empty weight of 6,400kg and a maximum take-off weight of 10,600kg. It is capable of conducting missions under difficult weather conditions. It incorporates a large and spacious cabin at the centre fuselage, facilitating 20 troop seats or up to 12 stretchers. The crash-worthy seats accommodate a pilot, a co-pilot, two loadmasters and 18 combat troops. A sliding door is fitted on both sides of the cabin and a ramp is placed at the rear. The MRH-90 Taipan helicopter features a full glass cockpit at the forward section of the fuselage. The cockpit incorporates an instrument panel with five 8in x 8in colour multifunction displays (MFD) to display the data related to flight, mission, systems and maintenance. The avionics system comprises of the core avionics system to manage navigation and communication equipment, control and display management, avionics and vehicle systems. It also consists of a mission system to manage tactical communications, sensors and flight planning. The helicopter is equipped with a fly-by-wire, all electric flight control system, weather radar and forward looking infrared (FLIR) systems. A Monitoring and Diagnostic System (MDS) is installed to check the operation of several equipment and sub-systems. The MRH-90 Taipan helicopter is powered by two Rolls-Royce Turbomeca RTM322-01/9 turbo-shaft engines, which generate an output power of 1,662kW each. The helicopter has a four-bladed main rotor and a high positioned tail rotor coupled with the main transmission for anti-torque function. The tricycle type retractable landing gear features two single-tire main units to retract into the centre fuselage as well as a twin-wheel nose unit to pull back into the forward fuselage. The helicopter can fly at a maximum speed of 300km/h and has a range of 800km. It can operate at a service ceiling of 20,000ft and can climb at a rate of 8m per second. The MRH90 is the Australian version of the NH90 troop transport / utility helicopter manufactured by Nato Helicopter Industries (NHI). In August 2004, the Australian Ministry for Defence (MOD) approved the procurement of 12 MRH90 helicopters under phase 2 of the Air 9000 programme. The contract was awarded to Australian Aerospace for the supply of 12 helicopters and interim support systems in June 2005. An MRH90 sustainment contract and a strategic partner programme agreement were signed in July 2005. "The MRH90 is the Australian version of the NH90 troop transport / utility helicopter manufactured by Nato Helicopter Industries." In April 2006, the MOD approved the acquisition of 28 MRH90 helicopters for the Army and six MRH90s for the navy, under phases 4 and 6 of the Air 9000 programme. In June 2006, the ADF placed an order with Australian Aerospace for an additional 34 MRH90s, bringing the total number of orders to 46. The ADF commissioned the first two helicopters in Brisbane in December 2007. It grounded flight operations of the MRH90 fleet due to an engine failure of an MRH90 helicopter in April 2010. The operations were however recommenced in July 2010. In November 2011, an agreement was signed to resolve the identified flaws in MRH90 for ensuring timely deliveries of the helicopters. Australian Aerospace delivered 15th helicopter to the ADF in December 2011. Australian Aerospace signed an agreement with the ADF in May 2013 to provide affordable, enhanced MRH90s to the Australian Navy and Army. The company also agreed to deliver 47th helicopter to the ADF. The ADF received first of two MRH90 helicopter simulators in August 2013 and the second is scheduled to be delivered in 2014. The Australian Navy has been conducting trials, testing and training on the MRH90 since 2010. The helicopter successfully performed flight trials from HMAS Choules in April and May 2012. Two MRH90s were introduced into the Navy’s fleet in July 2013. The Australian Navy conducted flight operations of the MRH90 on board Canberra Landing Helicopter Deck (LHD) at the HMAS Albatross air station in June 2014. The first operational capability of the Army’s MRH90 helicopter is scheduled for July 2014. The helicopter is expected to achieve first airmobile capability under the second operational capability in September 2014. The first operational capability of the Navy’s MRH90 is currently delayed by 45 months.